When I was thirteen, I become obsessed with 007. I had the movies all on VHS. I even wrote amy own spy novel in the 7th grade. Then I grew up. But these recent Bond movies have rekindled my fondness of the franchise in a new way. It’s no longer about gadgets and freaky bad guys and exotic locations—well, it’s still sort of like that. But it’s also about the relevance the rebooted franchise brings. It used to be all fun and games about spy games and the cold war. Now it’s a serious look at the measures people take in the shadows to secure the interests of empires. And I think this film struck a very deep chord with the fears of people in great nations and their “small” mistakes. From the moment Bond emerges from the shadows and we see his eyes, we know we are about to get a closer look at the man that has become an icon of espionage. This movie is a nostalgic exploration of the Bond’s place in the world, and his character is tried in ways he has never been before, emotionally and physically as a tired and worn man who has to confront his demons, and the demons of his murderous profession. As said in the film, “sometimes the old ways are the best.” In this emerging world, villains (and heroes) can work “in their pajamas” and wreak havoc from a computer, but nonetheless we always resort to guns, choppers, and fists. Our tactics may change, but we always resort to the same old ways. And our oldest secrets always seem to resurface. This film is about the price of change, and the inevitable emergence of our mistakes to haunt us. We get into 007’s backstory, and for the first time we get more than a glimpse of M’s own role as Bond’s boss and surrogate mother-figure. One big theme of this film is how our allies, and even enemies, often become our surrogate family, especially for those who have no one. 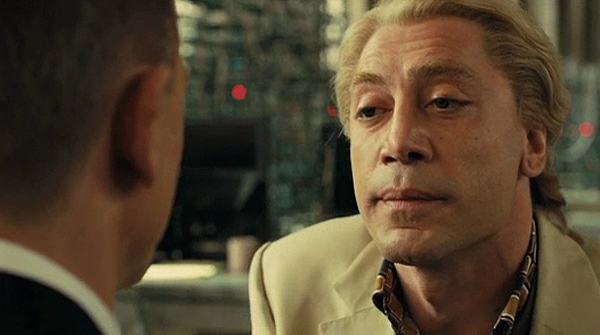 Javier Bardem alone plays a villain unlike one we have encountered for a long time. He’s unstable, he’s haunted, he’s even pitiable. He may lead us to recall Nolan’s Joker interpretation with his unpredictable style, his apparent lack of a plan, his dramatic entrances and his willingness to even be caught. He’s not just another big rat for Bond to exterminate, he’s a reflection of the horrors found in the world of political espionage. Wars fought in the shadows produce monsters and demons for everyone involved. And even the “good guys” are responsible. As one of the lines repeats in the film: Think on your sins. This wasn’t the first time Bond “died” in the franchise. In You Only Live Twice Connery’s Bond fakes his death. But this time Bond is abandoned and left for dead, and he plays retirement until his “mother” is threatened. We see soon how alone Bond has been his whole life, possible explaining his drinking and womanizing. He’s not just a cavalier jerk, he suffocates the pains of his childhood and suffers the pain of a lonely and callous profession. Bond’s pursuit of his assassin in Turkey and Shanghai is a dichotomy: The cinematic “new way” outrageous stunts and the cinematic “old way” being Hitchcockian camera angles and quiet suspense; yet the high octane opening chase represents the old Bond of bounding through four different vehicles, whereas the new Bond must adapt by having bullets traced and waiting for the perfect moment to strike. The fight between him and the assassin sets their silhouettes against a beautiful backdrop, a sequence that may go down as a classic, part Hitchcock, part Tarantino. The new woman is mysterious too, and plays a tragic role not new to the Bond world, but quite unique. We seem to soon forget that she was a trafficked girl, not a villainous wench or a mere traumatized girlfriend. Although the film treats it like just another suave moment for Bond, we forget that he takes advantage of a girl once made to sleep with men for money in a brutal slave trade. If we’re conscious we’re reminded that perhaps he is no better than Raoul Silva. One serves the empire, the other serves himself, but they both give in their demons. Bond is unable to save Sévérine not because the contest is unfair, but because it is fair. Her death is equally a consequence of his turn to alcohol, his prideful belief in his abilities, and M’s faithfulness in his abilities, as much as it is Silva’s own choice to shoot her. The sad thing is, I don’t think audiences would get that. Sévérine is just another dead girl with a bed and a drink to her name, a victim of such great ambitions. Silva himself comes in late, but swallows the screen time with his brilliant portrayal. He’s multi-dimensional. He appears to Bond like a long-lost brother, a reflection of Bond himself, tempting him to reject the lady (meaning both M and the Queen) who has used and abused him, ironically after killing a woman the two of them have abused. Silva’s tale of the rats in the barrel is an apt metaphor for every structure of armed service every country ever builds. We make men into rats trained to eat one another, and we leave them there to do so. If and when we let them out, it is too late. Their nature is changed. You reap what you sow. When Silva reveals himself to M, and removes his false plate, he becomes a symbol for the monstrosity of this world of shadows where nobody is truly a hero or a villain. This haunts M because she knows she is responsible for her sins. Silva isn’t wrong, he’s just pushed himself beyond redemption, whereas M seems willing to confront her sins. I first thought “Skyfall” would be a codeword for some program or operation that involved trading spies or (ironically) killing them to prevent blowback. This was involved, but I was surprised by the turn the movie took when we were introduced to the “Skyfall estate.” For the first time in Bond’s cinematic life, we are given a deep, meditative treatment of his childhood and family. The theme blossoms into what seems to be the completion of an “origins trilogy” for Bond. Casino Royale was a reboot that gave his his entrance as an agent and made him lose all innocence he had left. Quantum was his descent into his character, bent on revenge and losing whatever tenderness was left in him, dumping his friend in the trash and leaving the villain to die of thirst rather than just executing him. 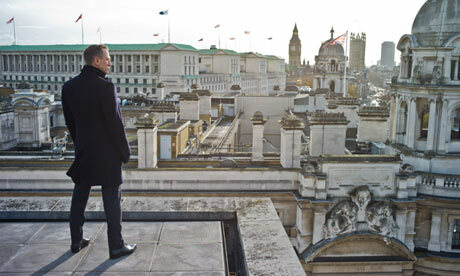 Finally, Skyfall “kills” him and allows him to “resurrect”: his “hobby”, as he tells Silvia. He has become so callous and worn, but now he must explore his deeply-seated fears and emotions, revitalizing his character, and confronting what kind of man he will be and how it will affect his service to the crown. His last mission in the film is to protect not his country, but his surrogate mother, the very one who abandoned him and many other agents. The priest hole in the estate represents that one tender spot left in his heart, the place where he went as a child and emerged as a man, and the frozen like represents his death and resurrection as a new man, as if purging the sins of himself and of MI6. In the chapel, he confronts his mother and his “brother” agent, this tortured man who can’t even seem to bring himself to kill M. But as M is already dying, she fearlessly faces Silva, the monster she helped create, purging herself of her guilt and cleaning her conscience, while this man is left to the fate of dying tortured and alone. Bond, who slays this demon, is left to look back on a past destroyed forever, wondering if he will ever become that demon. Without his “mother” to guide him, he must face that future on his own, a new man. And so the entire MI6 is recreated, new M, new Q, new Moneypenny, and a “new” Bond that now has to bury the past for good and begin again in an ever-changing, yet ever familiar, world of espionage and treachery. I look forward to the next one. Happy 50th cinematic Anniversary, 007. This entry was posted in Film and tagged 007, James Bond, Javier Bardem, Judi Dench, M, MI6, Moneypenny, Q, Skyfall, spies. Bookmark the permalink.